This is an assembled board of DC-DC converter module. 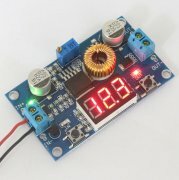 It can offer 75W of power, and a maximum of 5A of current. It can be used as a standard power supply, or for audio application that do not have critical requirement on noise performance. The board includes a 3 digital LED voltmeter to read the input/output(toggle by a button) voltage. The voltmeter error is +/-0.05V. The display can also be turned off by toggling another button. The board includes a heatsink that can be attached to the DC-DC converter IC, and 4 pieces of standoff to mount the board onto chassis. Output power: Recommended maximum of 75W. If more than 50W please make sure to add included heatsink. Input/Output display selector button and LEDs. For maximum output stability, keep the minimum voltage difference to as close as 1.5V as possible. 4 Mounting holes with supplied mounts.